and led a life of debauchery. where the noted evangelist George Whitefield was preaching. Robinson went for the purpose of "scoffing at those poor, deluded Methodists"
and ended up professing faith in Christ as his Savior. Our blessings are great and many, my friends. for His amazing presence in our lives. May you and yours have a beautiful Thanksgiving week. Beautiful. I am home, friend, and I want to thank you for your prayers...I hope you have a lovely Thanksgiving. Oh Stephanie, I love this hymn. As it happens I'm learning to pick it on the ukulele. Happy Lord's Day to you! This is one of my most favorite hymns. Happy Sunday Stephanie! Happy Thanksgiving. Blessings to you and your family! The church group I meet with primarily sing contemporary hymns and so these old ones gather dust and and sit on the shelf. But I grew up singing these old hymns and I LOVE them. The lyrics resonate with me and the melodies which have never left me, bring me JOY in so many different life circumstances, so thank you for posting them and reminding me that although times change, GOD Never Does. Our message today was a reminder of the fact that we should live our lives thankfully because of all the blessing, especially the blessing of salvation. This song is perfect after hearing that. I liked reading the story of the author too. Beautiful! I love the scriptures and the hymn. Have a blessed Thanksgiving. QUE HERMOSO HIMNO, EN NUESTRA CONGREGACION SE USA CUANDO HAY BAUTISMOS: EN LAS AGUAS DEL BAUTISMO A JESUS SIGUIENDO ESTOY....... CUANTOS RECUERDOS DE LOS VIEJOS HIMNOS QUE SE CANTABAN HACE TANTOS Y TANTOS AÑOS ATRAS. HOY LA IGLESIA ESTA SIENDO INVADIDA POR MUSICA MUY RUIDOSA, CON POCA LETRA ESPIRITUAL, QUE PENA ME DA, COMO ME GUSTARIA PODER VOLVER AÑOS ATRAS, CUANDO ERA UNA NIÑA EN LO ESPIRITUAL Y CRECIA CON ESTOS BELLOS HIMNOS. DIOS LE BENDIGA RICAMENTE DESDE BUENOS AIRES, ARGENTINA. Oh, I just love that tune of Come Thou Fount of Every Blessing, Stephanie. What a perfect hymn to share during this Thanksgiving week. Also, Thank you for the history of Robert Robinson, who certainly turned his life around. 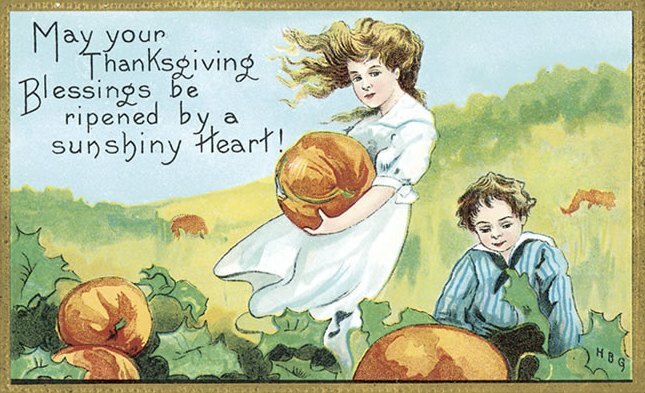 May you and your loved ones have a Happy Thanksgiving, sweet friend. Love and hugs to you. Hi Stephanie, I hope you enjoyed beautiful Sunday..and happy Thanksgiving to you! This song is very calming. 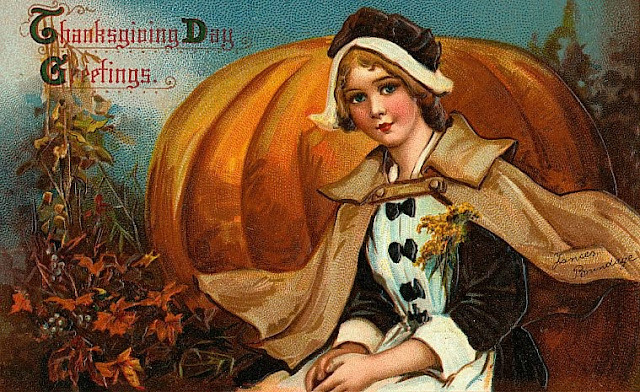 Oh, I love these vintage Thanksgiving pictures, Stephanie. My sister first introduced me to the vintage cards many years ago, so I think I will pass this last one on to her, she'll like it. I am so thankful for the friendship you have given me in this blog land, and I appreciate you so much. You exude goodness in all that you do. What a testimony of Robert Robinson, actually brought tears to my eyes. I love hearing if how others have come to a saving knowledge of Jesus Christ. To think he went to mock, yet, found the love, grace and mercy of God. Yay for the poor, deluded Methodists -- they spurred the writing of one of my favorite hymns! I actually heard this on the radio on my way home from church today. It was David Crowder's version which I love. Hope you enjoy a great start to the week and enjoy a wonderful Thanksgiving! One of my favorite hymns, Stephanie! Happy Thanksgiving!! This is so beautiful. I cherish those words. Oh to grace how great a debtor daily I'm constrained to be. My favorite gospel hymn! Thanks for the information about the author. I didn't know that. Beautiful post, I wish our church sang more of the old hymns, we have them every once in awhile but they have gone to more modern music... Wow it is amazing his background, it is wonderful how God changes our hearts and turns our lives around! Wishing you and your family a most wonderful Thanksgiving! Hi Stephanie, wishing you and your family a Happy Thanksgiving. I do hope that you are having a beautiful Thanksgiving week. Dear Stephanie, oh what joy your sharings and this most gracious hymn brought to me. I am ever amazed of the wondrous writings of those who poured into song from their hearts their immense love for the Lord! And this may be one of my favorites yet as I read the lyrics and the beauty of each phrase sets in my heart. Thank you so much for sharing this, as well as the history of Pastor Robinson- what a joy to hear stories of such individuals who found their faith and the Savior in such a way! I have had your post up in my browser and I am sorry I am just getting a chance to comment and also thank you so much for your comments and notes you recently left- can I tell you just how much my heart was blessed to see them! Words cannot express what a delight I felt at reading your comments and kind words and thoughts that warmed my heart so... and I thank you also for your sweet words about my blouse/sewing project that meant so much :) I am so blessed by your friendship- you too are in my thoughts and prayers so often, and in this season of thanks (and always) I thank the Lord for your precious friendship♥ It is lovely to think of you each time I hear one of your favorite hymns or when I walk in to a certain store we share a love for (Hobby Lobby☺) and see the holiday decor and think of you, or when I see the beautiful ornament you made me that brings me such a smile. I wish you and your family the most joyous and blessed Thanksgiving!! Thanksgiving blessings to you, Friend! There are indeed many blessings to be thankful for, each and every day. Hope your Thanksgiving was filled with love and good things to eat.